A cable that brings power ashore from an offshore windfarm has failed and needs to be replaced in the spring. E.on, the firm that owns Scroby Sands windfarm two kilometres off the Norfolk coast at Caister, said one of its three high-voltage cables had failed. The company said despite the problem about 95% of the energy generated can still be brought ashore. E.on's other off-shore windfarm at Blyth, Northumberland, is also awaiting repair after a sub-sea cable broke. The cable failure at Scroby Sands, which opened in 2004, is the latest in a number of problems to dog the 30-turbine windfarm. In 2006 and 2007 all of the turbines were given replacement generators and gearboxes under guarantee from the manufacturers Vestas. In the summer of 2007 part of the promenade on Great Yarmouth's north parade was excavated to allow repairs to one of the 33,000-volt cables which had failed because moisture had seeped into a connection joint. A worker was treated in hospital for burns caused by an electrical flash while working to repair those cables. Jamee Majid, spokesman for E.on, said: "The cable isn't working properly and we're not entirely sure what's caused the failure. "As we move forward we learn how the equipment interacts with the environment. That's part of the learning process. A statement to the BBC released on behalf of energy minister Malcolm Wicks said off-shore windfarms were an emerging technology and subsidising and investing in more was not a waste of money. 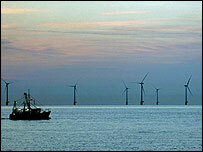 The statement said: "Offshore wind is a new technology operating in a harsh marine environment. "These projects are early demonstration projects designed to test the technology to enable larger projects in the future to be better designed and developed. "Whilst there have been problems with individual turbines...there is no reason to stop building off-shore wind farms."